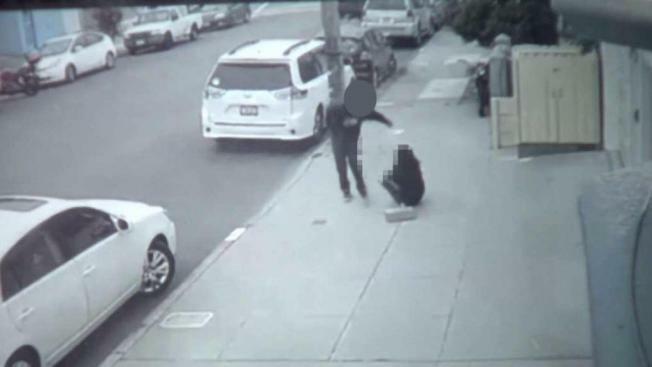 A woman walking down a Portola district street earlier this month was grabbed, flung to the ground and struck – and the entire, seemingly random, attack was captured on surveillance cameras. The disturbing video, which has a date stamp of Aug. 10, shows a man blindsiding the victim in broad daylight, wrestling her to the ground on Sweeny Street and running away. Two different cameras show the unprovoked assault and apparent robbery as the suspect appears to take something from the woman’s hand. As she struggles to get up, he doubles back, hits her in the face and races off in the same direction from which he came. People who live in the area were shocked and said they were trying to wrap their heads around the violent attack. "Oh my God, horrible! That is just horrific. And yet, the audacity of that man to just push her down and come back and hit her again!" said Rose Orellana, who lives near the crime scene. A woman, identified only as Paige, who lives in the area said she was shocked by the footage. “I think I would call 911 right away and just yell,” she said. Paige said she too was recently accosted by a man who tried to spit in her face. “It’s scary, because I walk this block all the time. I walk with my kids, I walk with my parents, and now it seems like you can’t walk by yourself,” she said. The owners of the security cameras told NBC Bay Area that they’ve shared the images with police. The San Francisco Police Department remains tight-lipped about the incident, saying only that there is an “active and ongoing” investigation. The neighborhood association is concerned about an uptick in crime. So, too, is Supervisor Hillary Ronen, whose Chief of Staff Carolyn Goossen said that 40 percent of the district is Chinese-speaking, and Asians are being disproportionately affected by the lawlessness. Police would not corroborate that, but did confirm that the assault victim is Asian.